Um Amra said police became suspicious when they saw the men lugging two heavy bags past customs officers. It was the first known case of ivory smuggling through Siem Reap, a busy tourist destination and site of the famous Angkor Wat temple complex. More than 400 suspects were arrested in January in Asia and Africa in a crackdown by 28 nations on poaching that is threatening to wipe out elephants and other wildlife species in Africa. Cambodia was one of the nations involved the monthlong "Operation Cobra II," but it was not immediately known whether Monday's arrests were related. Vietnam and China are major destinations for ivory. 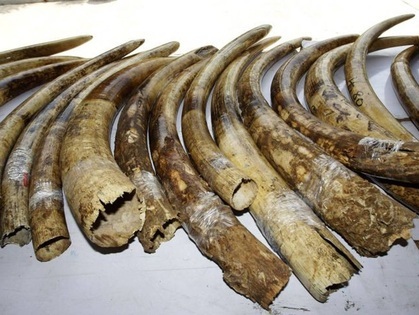 In late January, police in the West African nation of Togo said they seized 1,689 kilograms (3,723 pounds) of elephant tusks concealed in a container destined for Vietnam. The market price of ivory is more than $1,000 a pound ($2,200 per kilogram) and has more than doubled in the past five years, according to the World Wildlife Fund.